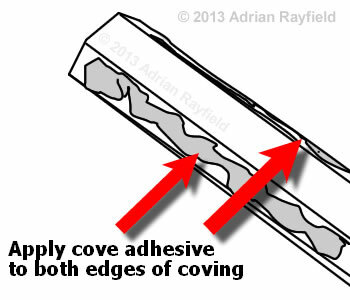 In a previous post I talked about coving and cornice and the types of coving, this post deals with fitting coving. I’m going to tell you how to fit coving based on the standard 127 mm or 90 mm concave coving, but the principle is the same for all coving / cornice. The first job you need to do is mark the ceiling and wall so you can line the coving up to it, depending on the size of coving will determine the measurement but as a guide, concave 127 mm draw a horizontal line 83 mm down the wall and also 83 mm on the ceiling, this is where the coving will go. For 90 mm concave coving measure and draw a line 62.5 mm on the wall and ceiling. Note that there is a right and a wrong way to put up the coving, each length of coving should either have wall line or ceiling line written on it, ensure that all lengths are put up the same way with the corresponding edge on the correct surface, either wall or ceiling as labeled. Now, put on your safety glasses. If you walls and ceiling are new plaster you will need to seal these with a diluted PVA solution where the coving is going. If the surfaces are previously painted you need to score this with the edge of the scraper, if the surfaces have been papered you need to remove this first then score the ceiling and wall. You can not put coving up over wallpaper. Brush down the area of ceiling and wall the coving is going and ensure any loose paint is removed. Now is the time to measure and cut the lengths of coving, you may need a helping hand here. Use the tape measure and measure the length of the wall the first piece of coving is going, measure from internal corner to internal corner. If the length of wall is longer than the length of coving you will have to use two lengths, more on this later. once you have done this cut one end of the coving with an internal mitre using the mitre block or ideally a template made by the manufacturer. Now measure from the tip of the cut end and mark the length of the wall onto it, now cut the other internal mitre. Hold the length up to the wall and try it to ensure it fits, if need be you can trim the end. Continue to measure, cut and try the remaining lengths of coving, now your ready to fix it, take a clean bucket and put a small amount of cold water into it, tip some cove adhesive into the water and mix, you are looking for a stiff creamy consistency. The adhesive is only workable for around 45 minutes so only mix enough up for you to use up, but enough for at least one length. Use the scrapper to apply the adhesive to the back of the coving, ensure you put enough on to squeeze out as you push the coving into place. Once you have applied the adhesive to the full length of the coving and to both edges push the coving firmly into place making sure the coving is up the correct way and you follow the previously marked lines on the ceiling and wall. 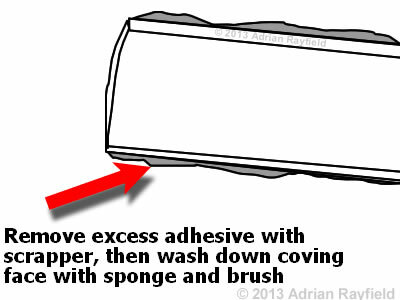 As you push the coving into place, the adhesive will squeeze out, take your scrapper and remove the excess adhesive. Use clean water and sponge to wipe any adhesive off the wall and the paint brush to wash the face and edges of the coving. As you go around the room you will have joints and corners that have gaps where the wall isn’t square or the mitre wasn’t cut exactly, use the adhesive to fill these, it can be rubbed down once dried. Once all the coving is up allow 12-24 hours for the adhesive to set and dry before decorating. As you go around the room you may have to join two lengths of coving together, this isn’t done by a straight joint but a mitred joint, cur the end of one length and then cut the end of the other length to allow the two to marry up and leave a seamless joint. Fix coving up and fill as required with the adhesive. The corners should all be mitred but as most walls and ceilings are not true square you will find gaps in the corner, simply fill these with adhesive and use your scrapper and wet paint brush to fill these in. Don’t use ordinary filler as this is hard to rub down an you will damage the paper on the face of the coving. 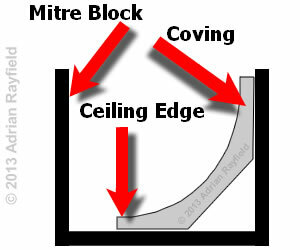 If you are using a mitre block always put the ceiling line on the bottom of the mitre block, so the coving is ‘upside down’. 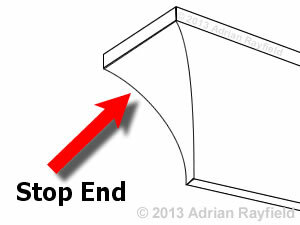 You may come up against a situation where a door frame goes up to the ceiling, to deal with this we use a stop end, this is an external mitre cut, now use an off-cut to cut the corresponding mitre and cut square the end that fits onto the wall, this can be a tricky cut, be careful with the smaller infill part as it will break very easily. Apply adhesive and fix, fill as required. 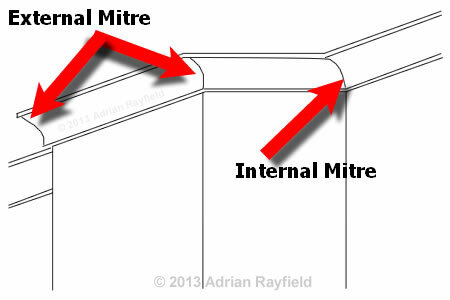 If you really are not happy trying to cut corner mitres, most manufactures make preformed corners that you can buy, fix and have a straight joint from each end. I personally don’t like these and have seen a few examples of them put up and they don’t look that good as the corner didn’t match up that well with the straight length, but it is your choice.